Think about the way you react to black and white photographs — like they're remnants from an ancient time period. Now imagine reacting to today's Instagrams and selfies that way. Palmer Luckey, the creator of the virtual reality tech company Oculus, predicts it's going to happen. "I think our grandchildren are going to look and say, 'Wow, can you believe that in the 2000s the only way to record a sports game or a family event was to take those still shots through a tiny window?' We're in for a big change," he says. Admittedly, Luckey is peering far into the future. But he believes that people will someday "capture most things as full, virtual reality scene, captures that can be played back years or decades later." 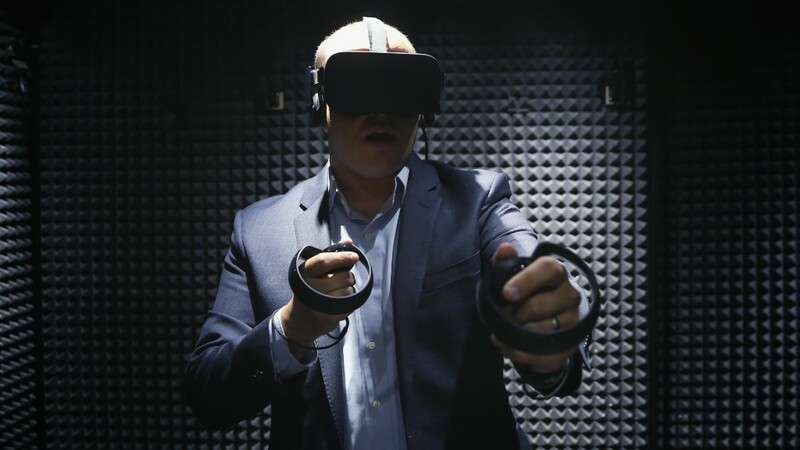 With an Oculus headset, you'll be able to re-live experiences as if you're actually there, at a wedding or a graduation or a concert or a surprise party. Virtual reality is a new form of media, one that must be seen to be truly understood. A high-quality VR video convinces the viewer that they've been transported to the place they're seeing. So it's no surprise that many news organizations and Hollywood studios are experimenting with VR production. Much of the innovation to date has happened in the gaming industry. "They're the first people to latch onto this," Luckey says. The Oculus Rift headset will go on sale in the first quarter of 2016. That's when gamers will be able to try it out for themselves. In the meantime, competitors like Google and Samsung are marketing their own VR products. On November 8 The New York Times is mailing more than a million Google Cardboard VR headsets to print subscribers -- part of a promotion for a new VR experience produced by The Times Magazine. This continued expansion of the technology helps explain why Luckey is confident that the spread of VR is inevitable. Even if Oculus fails, "the Pandora's Box has been opened," he says. "People now understand that good virtual reality that tricks your subconscious is possible. They understand that it's within the realm of possibility to make something that is as real as the real world. If enough people know that, we're never going to stop. We are going to make this happen." Asked about virtual reality applications beyond the realm of gaming, Luckey talks about medical applications that help surgical students see inside patients and virtual field trips that can "take people to the moon." Luckey says "nobody knows what the killer application of VR is going to be yet." But the company that acquired Oculus last year, Facebook, is most intrigued by the uses for communication. It doesn't exist yet, but "once you have high fidelity virtual reality that's similar to the quality of real life, you can take people from opposite sides of the world and put them into the same virtual room together," Luckey says. First Luckey has to get the Oculus Rift onto the faces of ordinary users. Analysts expect the headset plus the necessary high-powered PC hardware to cost about $1,500. The biggest challenge, Luckey says, is to make the technology cheaper so that "everyone in the world can experience VR." The outcome should be that "anyone can use it to go on a virtual field trip; anybody can use it to see their friend's wedding; anybody can use it to connect with people on the other side of the world. That's our long term goal," Luckey says, "and I think it's only a matter of time."